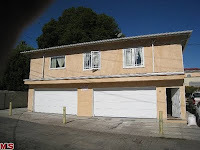 The Bank Owned REO at 2387 Malcolm Ave., LA CA 90064 lasted 43 days on the market before receiving an accepted offer on 1/7/10. The property was listed on 11/24/09 for $700,000 and had one price reduction down to $665,000. 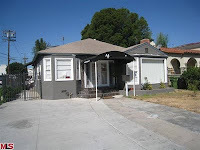 The REO closed on 4/14/10 for $590,000. According to the MLS, the home is a 2 bedroom / 1 bath, 1,135 sq ft of living space on a 5,793 sq ft lot. What's unsual about the property is there is no kitchen, at all, in the main house and there is a 4 car garage out back with an apartment on top of it. The apartment space does have a kitchen and a full bath. There is no mention of the square footage of the apartment, but it is pretty large, covering the entire top of the 4 car garage. The house is the last house before the alley on Malcolm, which lines up to the back of commercial property on Pico Blvd. In addition to the 4 car garage, there is at least outside parking for 4+ cars.